Featured in the New York Times, and Babytalk magazine! 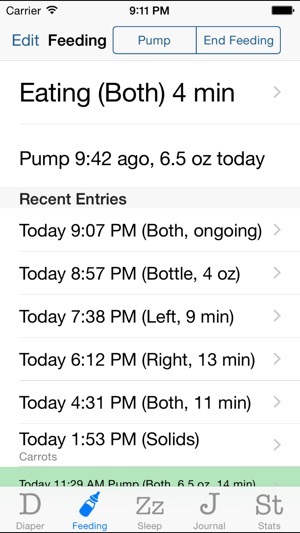 Easy-to-use app to keep track of an infant's diapers, feedings, naps, and more! * Track pumping and see how much you've pumped so far today. * Track Baths, Walks, other activities, and add Journal notes for doctor visits, vitamins, etc. * Export all data in csv (spreadsheet), rtf (word processing) or sqlite format for analysis, archiving, or to bring to the doctor's office with you. * Add descriptions/comments to all entries. Useful to note meconium diapers, fussy naps, or what types of solid foods you're trying. 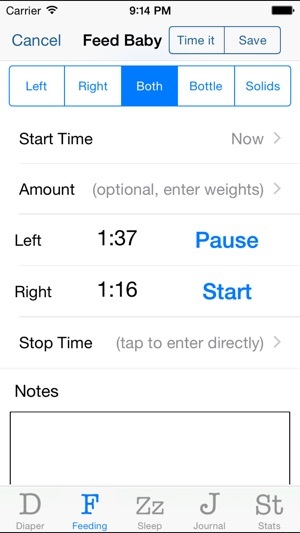 * Time feedings/pumpings with separate timers and pause buttons for Left and Right. * Track solid foods: what you introduce and when. * Optionally enter an amount. oz or mL. Or enter baby's weight before/after nursing and the amount will be calculated. * Easy to note which side to nurse on by looking at your last few feedings. * Edit entries in place if you have a typo. 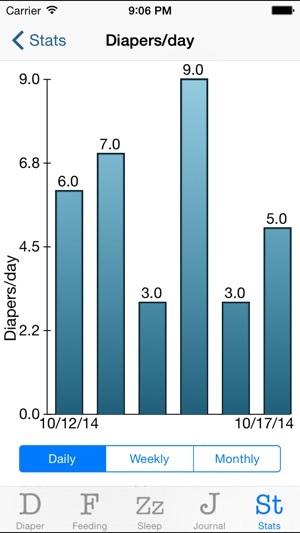 * Charts and graphs show information about diapers, feedings, sleep, height/weight, and more. This is my most-used app on my iPod and I love it! It's very well thought-out and is user-friendly. 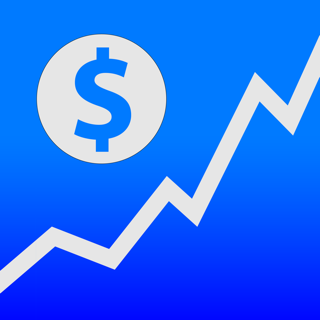 The one thing that would be even more helpful is a graphical analysis of the daily and weekly stats. 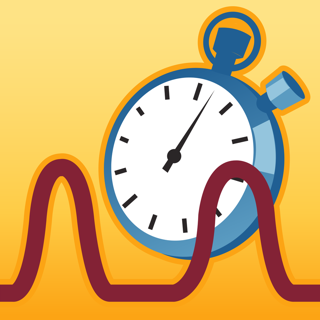 A side-by-side graphical analysis of sleep habits is crucial to learning your baby's sleep patterns as they develop and pinpointing sleep issues (as recommended by Dr. Weissbluth's popular book). I've finally taken to doing a pen and paper horizontal bar graph each day, but I know this wouldn't be too hard to add to the app, and would save tons of time! Please consider adding this feature--no other baby app has done it yet! One other thing in the update--I would always look over the day's feedings when I nursed, but now I notice that to go back to the main feedings page with your feeding notes you have to either cancel or quit the current feeding. I know I could use the 24 hour log, but I like to see just the feedings and not the other stuff. Thanks! Just found one other little "bug". When im using the start timer for one side and then click "both", the timer sometimes switches to the wrong side. E.g. If I nurse 5 min on right and then click "both" it says I nursed 5 min on my left, not right. Thanks! Been using this app since Christmas & love it! 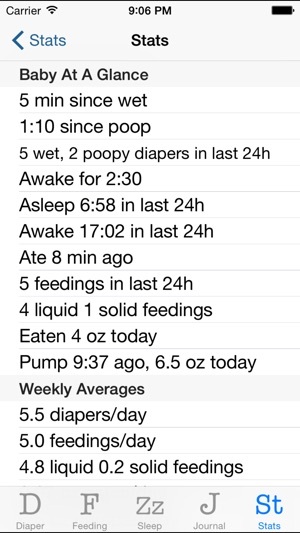 I find the upgrade that made poo diapers brown funny but useful because you can just glance at the day's diapers to see. Also LOVE the email export--THANK YOU! Only hiccup is that it wouldn't email anything newer than our last wifi export, but trust that bug will be fixed soon--any new users prob won't experience this? Only other request is to bring back the larger notes box--scrolling back & forth through a note to add something I forgot is not as user friendly as the larger box you had before! Overall, this app is a lifesaver!!! I use it to track everything baby & am using it today to examine her napping pattern to see what I can do to help her take a decent nap during the day. Update: Upgrade fixed email export--THANK YOU!!! & THANK YOU for the larger notes box again!!! Also, love that you changed pumping to green instead of brown like the poo diapers! ;). So now will night sleep be blue so I can see at a glance if I have it logged in right???? ;). 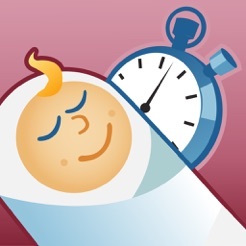 WONDERFUL APP--tried baby bix & baby timer is more useful overall! Update: Love the optional start / pause button!!!! 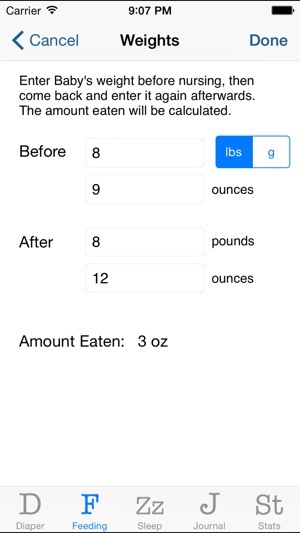 Love this app, great for tracking his daily needs, only glitch is that I track his feedings in mL's and when it adds it up for the daily total it gives a way off number that is way to high. Because of this I have to add the total up myself on a calculator. Can you fix this??? Other suggestions, under the journal section I would benefit from a medications tab and a daily weight tab. Otherwise, 5 stars!! And to be really perfect under feedings if there was an "other" option (other than bottle or breast) my son, and likely others, is fed from a G-tube for some of his feedings. Thanks!! UPDATE: since I posted this review, I also emailed the app created, and within 1 day he had already contacted me to see how he could help fix my problem and ask about the suggestions i had made. 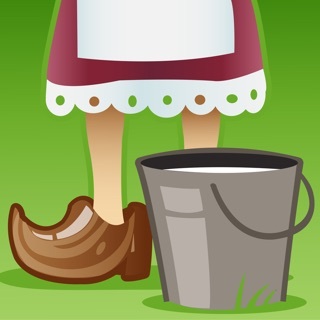 Excellent customer service, excellent app, I couldn't go a day without it! (and by the way the problem with the numbers adding up was my bad!) 5 stars!! !